Basalt or dense black shale, highly polished. Some aspects of the stone's surface appeared to suggest a laminar structure consistent with shale but further examination suggests basalt may be more likely. Here Parsvanatha, the 23rd Jain Saviour (‘tirthankara’), stands in the ‘kayotsarga’ posture. Long periods of immobility, with the arms hanging freely from the body, represent one form of severe penance undertaken on the path to liberation. A ‘naga’ (serpent) protects him with the coils of his body and shelters him with his seven hoods. Parsvanatha is flanked by the attendant minor deities Dharanendra and Padmavati, both holding a goad and noose in their hands. A triple umbrella and fly-whisks evoke Parsvanatha’s regal status. 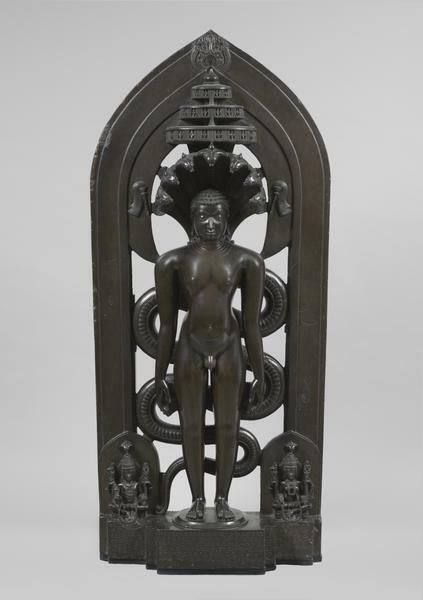 Here he is represented naked, which identifies the image as belonging to the Digambara ('sky-clad') sect of Jainism. An inscription on the base records that this image was made for a Jain shrine dedicated to Parsvanatha. It was created at Gulbarga when the temple was restored in the 12th century after a period of persecution. It also records the name of the ‘stone engraver’, Chakravarti Paloja, which is rare in Indian sculpture. The reverse of the back plate is inscribed ‘Parasa-naat’, an Anglicised rendition of Parsvanatha’s name, and ‘C.McK 1806’. These initials indicate that this sculpture once formed part of the collection of Colonel Colin McKenzie, the British antiquarian. Parsvanatha, the 23rd Jain Saviour (tirthankara), is standing in the kayotsarga posture, the 'setting free' of a body from earthly distractions. A seven-headed naga or serpent spirit protects the saint with the coils of his body and shelters him with his seven hoods. Parsvanatha is flanked by the yaksha or god Dharanendra and yakshi or goddess Padmavati, both holding a goad and noose in their hands. Long periods of immobility, with the arms hanging freely from the body, represent one form of severe penance undertaken on the path to liberation. The proportions of the figure follow iconic convention: the shoulders are broad and the chest is slightly expanded, representing an inner breath. The waist is slim and athletic, with muscular details represented on the abdomen. Parvanatha is here represented as a naked image of the Digambara sect of Jains. A triple umbrella and fly-whisks evokes the regal status of Parsvanatha. The base bears an inscription in Old Kannada recording that this image was made for a Jain shrine dedicated to Parsvanatha at Garsoppa (or, as previously thought, Gulbarga) at the time of the temple's restoration after a period of persecution. It also records the name of the sculptor ('stone engraver'), Chakravarti Paloja, a rare occurrence in Indian sculpture. As well as the inscription on the front, the sculpture also bears a second inscription that throws light on another chapter of its history. On the reverse of the back-plate is an anglicized rendition of the deity's name, Parasa-naat, and the mark "C.McK 1806" which confirms that this sculpture once formed part of the collection of Colonel Colin McKenzie, the British antiquarian whose survey of the Deccan was completed in that year. The sculpture was given to the East India Company in 1808 by Col. MacKenzie, who shipped it to their Directors in London in the ship 'Phoenix'. It was incorporated in the collections of the East India Company's India Museum in London. The sculpture was transferred to the South Kensington Museum (now the V&A) from the India Museum in 1879. The India Museum slip book entry states that it was received from 'McKenzie' and that it was 'taken from a ruined Busti (or temple) of Gasoppa [Garsoppa] anciently called Yarrum bardgaya [Yarumbaragaya], a town at the foot of the Western Ghats of Canara'. See J. Howes under 'References' for further details and discussion of the sculpture's provenance including information on documentation preserved in the British Library, which includes Mackenzie's account recording the discovery of the object at Garsoppa, now in Karnataka, and its transport to London as well as discussing its inscription. Dr Howes notes that Garsoppa is now called Jainabastikere. However, it seems probable that Yarrum bardgaya, rendered as Erambarage in the inscription, actually refers to Yelburga, also in Karnataka, and that the object was moved in the medieval period from there to Garsoppa. See Barnard, N. under references for further information. Figure of Parsvanatha, basalt or black shale, Karnataka, India, late 12th - early 14th century. L.D.Barnett, "Inscriptions in the V & A Museum", Journal of the Royal Asiatic Society, April 1915 pp. 337-9. John Guy, in P.Pal (ed.) The Peaceful Liberators: Jain Art from India 1994. p.166. 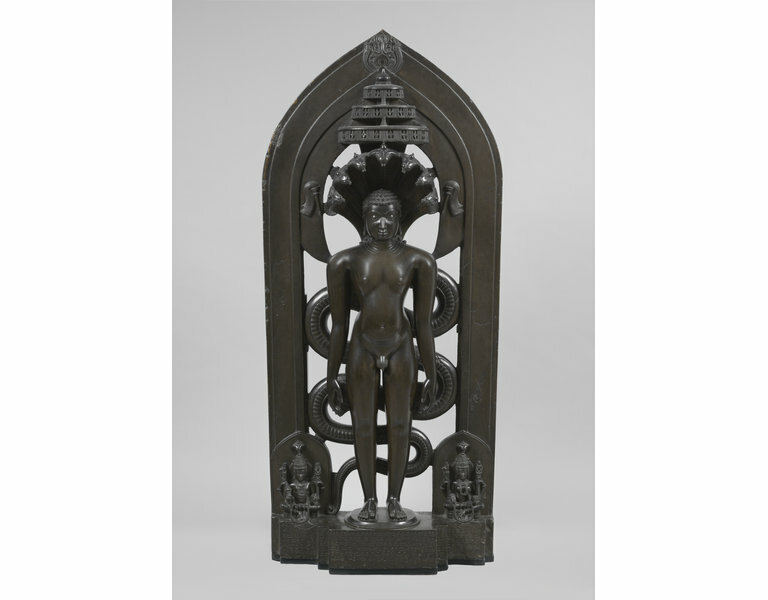 Guy, John: Indian Temple Sculpture, London : V & A Publications, , 2007. ISBN 971851775095. p.56. pl.57. Howes, Jennifer. 'The Mackenzie Parsvanath at the V&A: Research in Progress on the British Library’s Mackenzie Collection', SAALG Newsletter, issue 2, pp.3-6. Howes, Jennifer. Illustrating India : The Early Colonial Investigations of Colin Mackenzie (1784-1821) New Delhi : Oxford University Press, 2010. 269 p., ill. ISBN-13: 978-0-19-806441-1. ISBN-10: 0-19-806441-1. pp. 71-74 and 193. Barnard, Nick, Arts of Asia, Vol. no. 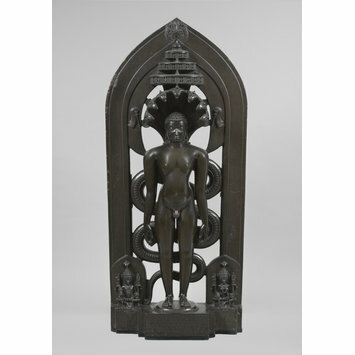 46, no 1, "The Jain Collections at the Victoria and Albert Museum". abandoned all possessions and remained immobile for long periods. posture.Like monks in the Digambara (‘sky-clad’) secttoday,he is naked. Dharanendra,who also appears in the form of a god with his consortPadmavati.The triple umbrella shows Parshvanatha’s sacred status. Parsvanatha, the 23rd Jain Saviour (tirthankara), is standing in the kayotsarga posture, the "setting free" of a body from earthly distractions. A naga protects the saint with the coils of his body and shelters him with his seven hoods. Parsvanatha is flanked by a yaksa Dharanendra and yaksi Padmavati, both holding a goad and noose in their hands. The base bears an inscription in Kanarese recording that this image was made for a Jain shrine dedicated to Parsvanatha at Gulbarga at the time of the temple's restoration in the 12th century after a period of persecution. It also records the name of the sculptor ("stone engraver"), Chakravarti Paloja, a rare occurrence in Indian sculpture. Karnataka, India. Formerly thought to have come from Gulbarga (Deccan) but this may have been due to a misreading of the inscription.